The 1992 Grand National was won by Party Politics in a time of nine minutes and 6.4 seconds and by a distance of two and a half lengths. The horse was owned by Patricia Thompson, trained by Nick Gaselee of Berkshire and ridden by Welsh jockey Carl Llewellyn. He was bought by Thompson three days before his Grand National victory. Eight year old Party Politics was a great favourite with the ‘once a year' punters because of his topical name, the race took place just a few days before the 1992 General Election. Standing at over 17hh he was the tallest horse to ever win the National and was priced at 14/1. A maximum field of 40 horses saw 22 complete the course with no fatalities. 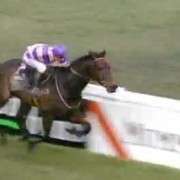 The 15/2 favourite on the day was Docklands Express who had fallen at the first fence in the previous year's National. He had won the Racing Post Chase at Kempton in February '92 and was placed third in the Cheltenham Gold Cup a few weeks before the National. Brown Windsor who had finished fourth in the 1990 race was ridden by Richard Dunwoody and started at 8/1. Laura's Beau looked a promising contender after winning the four mile National Handicap Chase three weeks prior and started at 12/1. On the first circuit Brown Windsor fell at Becher's Brook as a result of another horse crashing into him. On the second circuit an unusually large number of runners were still in contention at the Canal Turn, Laura's Beau came through to take the last fence in fourth place and after overtaking Dockland's Express on the run in finished in third position. Party Politics crossed the line to win by two and a half lengths from Romany King, his new owner collected £99,943.